A short video titled “Uncle Lamar’s Vision of Soccer in America” detailed Lamar Hunt’s commitment to soccer in the United States, from his introduction to the global game at the 1966 World Cup in England to the founding of the Dallas Tornado of the North American Soccer League, and from his pioneering role in Major League Soccer to the construction of the FC Dallas complex in Frisco in 2005. Local officials, including the school superintendent and mayor, were not all that interested in soccer-related issues. The superintendent focused on how the multi-use facility would grow as a high school football facility, and the Frisco mayor indicated that needed improvements were being made with the FCS national championship football in mind. At the press conference’s conclusion Hunt, Jr. spoke about his father. Somewhat disappointing for the Society of American Soccer History, there was little discussion of the American soccer past. Dan Hunt stated at one point, “We have a great story to tell. We want to share the game, where it’s been and where it’s going.” He mentioned that artifacts from the NSHOF collection would be on display in the exhibition space, but there was no talk of how the countless documents and artifacts from the Hall, now in temporary storage at Eurosport’s North Carolina warehouse, would make their way to their new home. Not to mention, how the historical community might be able to access them, curate them, and display them. 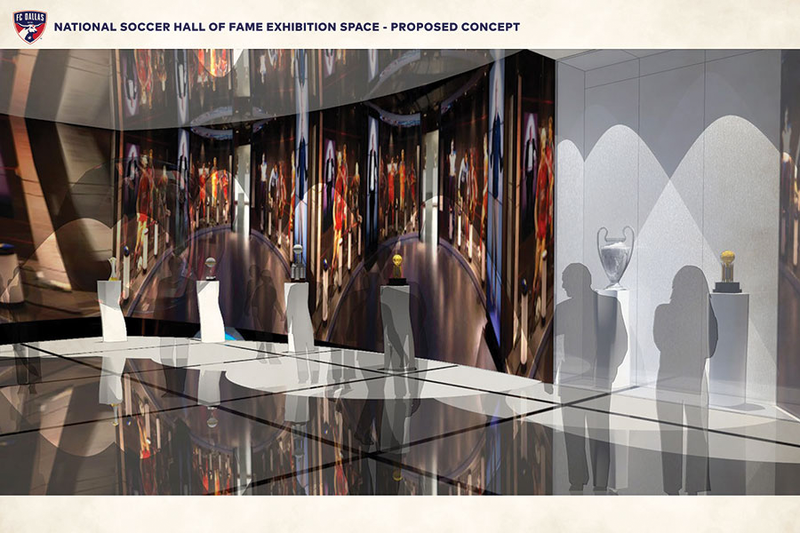 An article at US Soccer provided further details about what would be exhibited at the Hall. “The museum will be home to U.S. Soccer hardware, including the Women’s World Cup, Gold Cup and Lamar Hunt U.S. Open Cup trophies, as well as Olympic medals and memorabilia from the historic U.S. win over England in the 1950 World Cup, among other memorabilia and trophies.” But details on the Hall as a research facility were again absent. 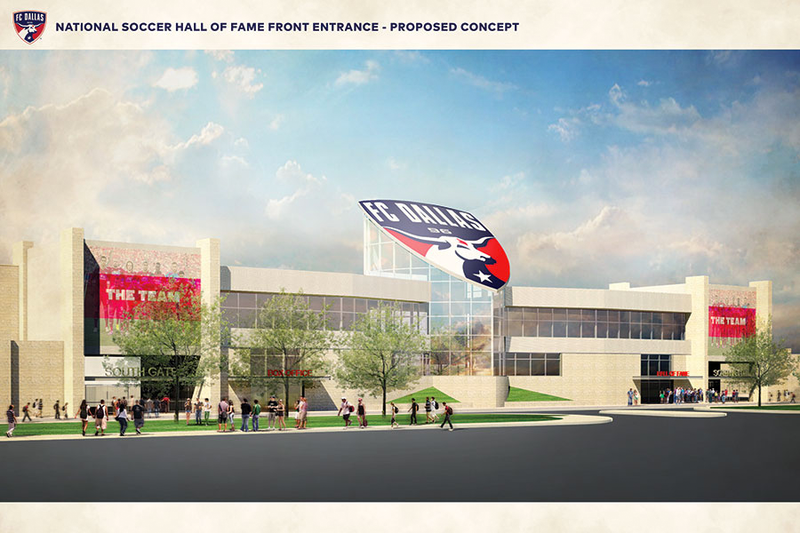 The Hunt Family, FC Dallas, and U.S. Soccer are “thinking big” about the annual hall of fame induction ceremonies, though. Ideally, the ceremonies would take place over the course of a weekend, Flynn said, and that a national team game could be played in conjunction. In the future there may well be two induction ceremonies on two separate weekends, one for the women and the other for the men. The Society can play an important role in helping the Hunts, FC Dallas, and U.S. Soccer shape what was called “a bucket-list destination for soccer fans from all over the world” by helping these organizations tell the great story that is the history of soccer in the United States. In particular, how to care for the collection that now sits in North Carolina and best present it to future generations interested in the long history of the game here. For more on the $39 million Toyota Stadium project, click here. 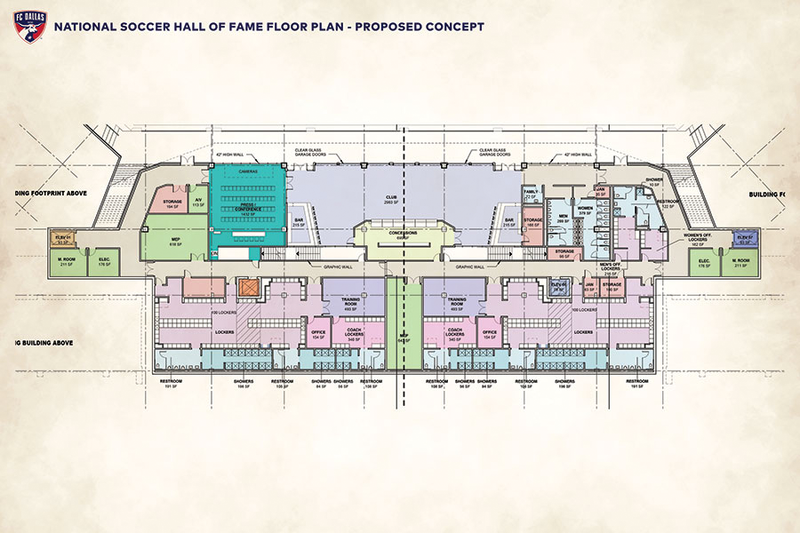 I’ve been saying since 2010 that for the Hall of Fame to find a new location would require the involvement of someone with very deep pockets, and that when that someone appeared, the location would be wherever they wanted it to be. That appears to me to be what has happened. I wish that the location were closer to me (I live near Philadelphia), but I never expected that it would be. I know people who say that Oneonta could have done a better job with less money than the $39 million that is being spent in Frisco. I think they are right, but I don’t think it really matters that they are right. The Frisco City Council certainly can’t be expected to put up the money needed to run a museum in upstate New York, more than 1,000 miles from Frisco, and I’m not aware of anyone else who was proposing to. So, I am cautiously optimistic that this development is a positive one. Having the Hall of Fame displays locked in a warehouse for the last five years has been painful. This seems like a vast improvement. Full disclosure: I have been the historian of the Hall of Fame since 2007 and have been compiling and maintaining the eligibility lists for the Hall of Fame’s elections since 1999. I thus have been working with the USSF on Hall of Fame matters since 2010 and can’t claim to be neutral in this matter. I want SASH involved and it would be a thrill, personally, to meet you, Roger.